Websites, Marketing, Apps, SEO & more. Coffs Harbour & Port Macquarie. We're more than just tech support. Your brand is the heart and soul of your company, which is why it’s important to have unique branding that reflects your business offerings and message. Equally important is ensuring you have branding that helps you standout from the crowd. We take great care in understanding your business to ensure the branding process aligns seamlessly with your business message. 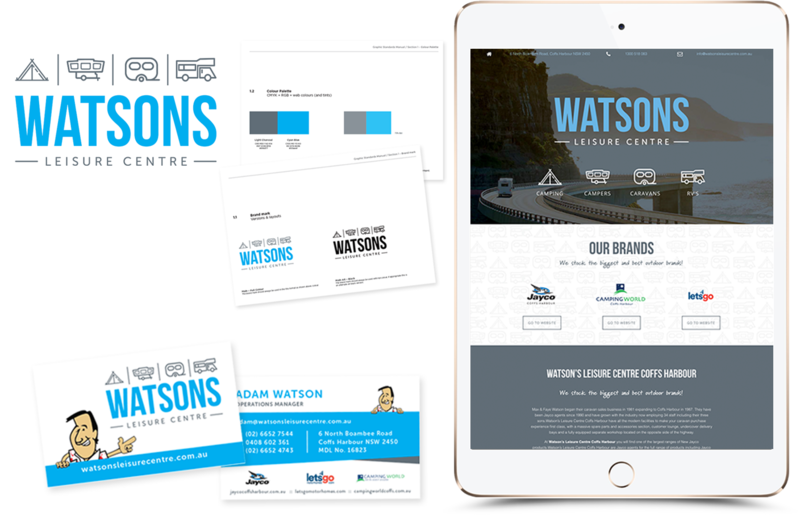 Watsons Leisure Centre is a long-standing client of ours, and as soon as we launched C3 Create, they approached us to strategise & develop their new parent brand and sub brands. Every piece of this huge project was crafted in close consultation with the client to ensure consistency and clarity. Here’s our finished concept for their new logo and a snapshot of some branding they received. Download our C3 Create brochure for a full breakdown of our services. We design with one goal: to communicate your message clearly, in a visually appealing way. Combining the right images with the right wording makes for a very successful design. Our training and experience has helped us understand what it takes to create effective designs – on time & within budget. We create a variety of collateral for businesses, including; brochures, magazines, catalogues, posters, print advertising, signage and stationery. Interested in Graphic Design for your business? Get in touch with our team. Your website's code helps it to appeal to search engines? Or that 48% of people cited a website’s design as the number one factor in deciding the credibility of a business. Or how about the fact that once your page loads, users form an opinion in .05 seconds? Pretty crazy, right? The need for businesses to partner with an experienced, knowledgable source for their web design is imperative to ensuring they stand out above their competition. We design and build websites that are uniquely beautiful and easy to navigate, no matter what device it’s being viewed on. We also employ ways to give your website a strong SEO ranking, and supply training and tips to help your company keep it that way. We even offer to handle that side of things for you! Speak to us about how we can help transform your online presence. Having a competitive advantage is key to consumers choosing you over the other guy. 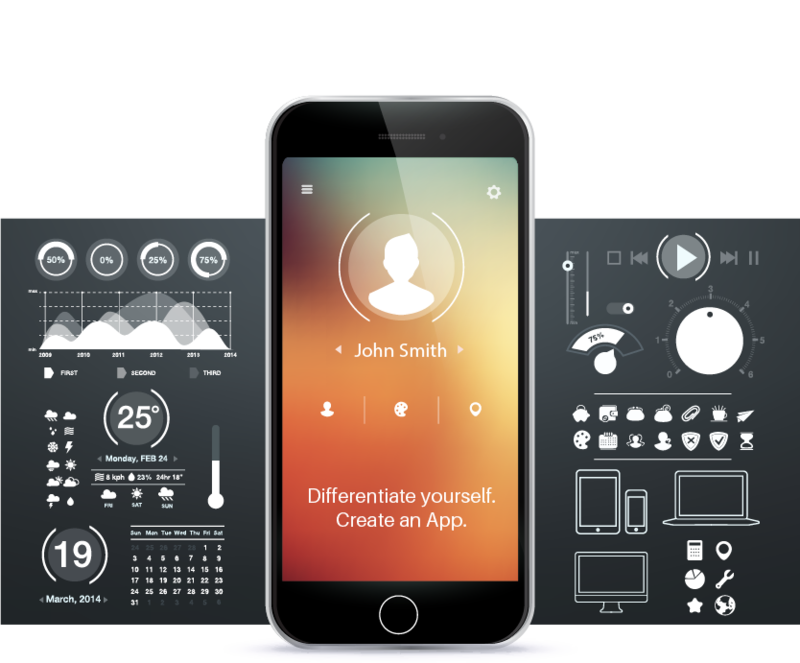 If you have an idea for an App that could differentiate you from your competitors, we can help you bring that vision to life! Our team creates high-quality Apps that are beautiful, user-friendly and responsive, with superior back-end functionality. No idea is too big or small for our team – we can cater to any App request. It’s well-known that images can speak louder than words; the same goes for engaging videos and graphics, too. Our photographer captures the essence of your business, by shooting staff photos, creating exclusive visuals for your web & content, showing your product offerings effectively; the list goes on. Our trained photographers and videographers have the latest tools to give you stunning photos and captivating video footage. Enquire about our Photography & Video services. Reaching a wider audience through social presence and engagement is crucial. Our social media strategists help you do exactly this! They can also take care of your ever-important content strategy. Content is king, and in most instances, this is what drives traffic and therefore leads through your website. We can produce powerful content that enforces consistency, provokes interest & conversation, and achieves results. What to engage more with your audience? Visual content is 40 times more likely to get shared on social media than other types of content (HubSpot). The best time of post on Facebook is 3pm on Wednesday. Other optimal times include 12pm – 1pm on Saturdays & Sundays, and 1pm – 4pm on Thursdays & Fridays (HubSpot). Top brands on Instagram are seeing a per-follower engagement rate of 4.21% which is 58 times higher than on Facebook and 120 times higher than on Twitter (Hootsuite). Tweets with images receive 18% more clicks than tweets without images (WordStream). We love the convenience of ‘pay as you go’ – seriously, who doesn’t!? It’s a trend that’s taking the world by storm, and we wanted our clients to leverage the same kind of flexibility and accessibility through us too! Our new style of finance was developed to allow you to get the hardware your business requires through a single, monthly fee that rids the complication of a bunch of small bills coming in at different times. This kind of set up allows your business to easily budget, track and measure IT related expenditure. Our finance options are sure to keep you and your staff productive, as you’ll be working off modern technology that’s safe and reliable. Your finance guy will also be thrilled as they’ll be dealing with simplified payment plans! And the best thing? You may benefit from tax incentives by renting, rather than purchasing outright.